Don't you just love it when a plan works out just as you hope? I had really hoped that the weather would cooperate for the much anticipated "farmer's wives go to Tulip Town". . .outing. We boarded the bus on Tuesday morning and drove 2 miles and the bus stopped at Tim Horton's . .
and we all got off the bus. Then. ..we drove 2 more miles and stopped at the border. . .
After forming a single line and producing passports for acceptable entrance to Washington State we all formed a single line and got back on the bus. We settled in for a proper bus tour taking the scenic route on roads less travelled and enjoyed the views which the massive bus windows allowed. The spring weather is cooler than usual and so we were treated to the end of the daffodil season. A little less tulips. ..but a little more daffodils. .
My room mate for the night was my sister-by-love Mary. I was seven when she married my brother and since then we have grown to be true sisters. She loves gardening as much as I love blogging and so we made a fantastic team in the field of flowers. Organizing details is never that far from my thought process.. .
and so I sent word to Judy the night before ..
asking her to save two spots on the bus since she would be hopping on 35 minutes before we would. When Mary and I hopped on . .
the seats were saved in a fashion that made me smile . .
and for a moment I was back on that elementary school bus once again as jackets were quickly removed from "our seats" as we neared Judy and her daughter-by-love Broni. We stopped at Roozengarde tulip farm on Tuesday morning and the sun came out on cue. Though the gardens were not yet fully in bloom. .
we enjoyed the early bloomers and enjoyed the true spring like conditions. Back on the bus. . I happily snapped away knowing that the pictures would not necessarily be completely clear and yet seeing the vast fields of green grass with daffodils and tulips in the background . .
We stopped for a salmon BBQ put on by the locals and then carried on to a Tulalip resort where we found quite beautiful rooms. ..with a OUTLET MALL next door. We waited a few minutes for the shuttle and then decided we could walk run much faster to the mall. 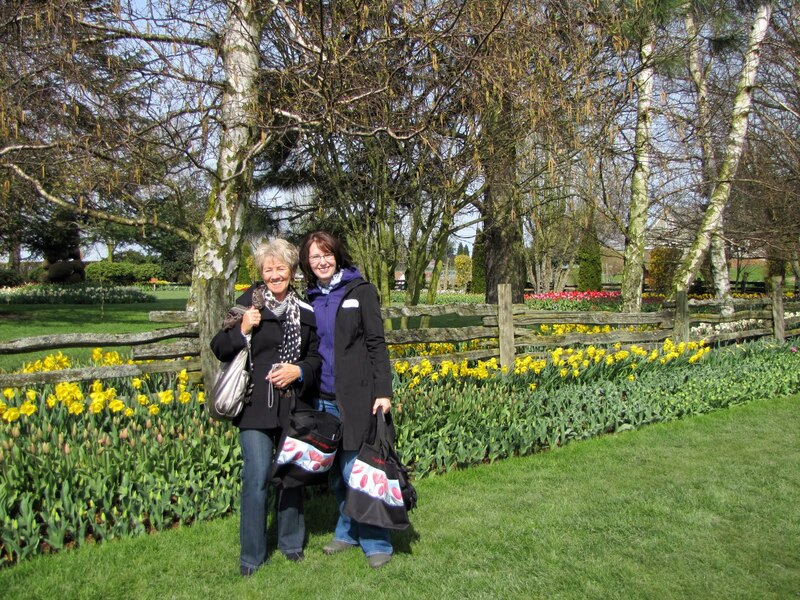 On Wednesday morning we boarded the bus again and headed to Tulip Town which has fields of tulips where you are allowed to roam. They ask that you not walk between the rows of tulips. So I mostly obeyed. . I kept at least one foot on the main path. . I noticed that my favorite color changed often during the day. I think I love yellow the most. .
Wednesday was cooler and clouds began to form in a serious manner. There were signs asking that we refrain from removing petals from the field. I left that tulip head laying there ..
What is it about rows of crimson flowers. .
buds all standing at attention and all identical in height? if I loved crimson better than true red. I never did get a group picture of the rest of the ladies on the bus ..
and was a bit sad that I didn't snap up pictures of some bloggy friends who have not blogs of their own but love blogging all the same. I met some wonderfully friendly ladies on the bus tour. It seemed they know me. .
and now I know them a bit too. It got really windy ..
and Broni did her level best not to fly away. I've always had a soft spot for pink too. Not dusty rose pink mind you . . I remembered here a kitchen I had at one time. .
petal pink and green trim. Clearly ...I love that combination. I can't say I've ever considered orange a favorite color. .
and yet with this particular tone of green .. I find it quite striking. The bus pulled into Laconner "noonish" and we made a bee line for our favorite luncheon place . . I meant to ask Judy if she would try to recreate the soup ..
one of us surely will. After crossing the border and arriving back to Canada. .
cell phones alerted husbands to come retrieve the farmer's wives. The ladies at the feed mill did an excellent job at organizing a time of enjoyment for us all and we appreciated their efforts so much. My calendar is cleared for next years event. This morning I woke up to big sloppy flakes of snow. .
and . .the birds are singing as per their usual optimism of such events..
while my beloved mumbled .. ."are you kidding me?" This evening is Lepp Farm Market cooking class. Tomorrow . .I'll let you know. .
What a great trip. You shared more photos than Judy did. She must be tuckered out. ☺ I think my favorites are the red-tipped yellow tulips. Right now I have some pink (not sure if they're petal pink) numbers on my dining table. Perhaps if I lived closer to tulip country, I could stop buying them. The pictures are far better than a bouquet. Enjoy the cooking class! How lovely! That's a place I'd love to visit. Snowdrops are pounding here also...hard to believe, I thought it was May 1. Looks like you all had a wonderful day and I loved how you described your bus stops and what you expected or did not expect. We'll see you all tonight and won't we all be a colorful batch just like those flowers. How cute! Sounds like you all had a great time! The fields of flowers...the good company on the bus...and even the weather...made it a wonderful get-away! Can you save me a seat for tonight? Smile. SNOW! Oye...please tell it to go before I get there! What a fun post! The fields of tulips look so beautiful! You were in my dad's back yard --- I looked to see if I could see his house. Alas, I could not. What a fun outing to do with girls! Great job perk Lovella! I could tell it was a visual and social feast, beauty in flowers, friends and family. So nice to be able to experience it all while someone else drives and arranges for stops and such. We have snow here today too! What a fun time you all had! I'm heading down that way in the middle of May, and I fear that the tulips will all be finished - but I'll take the detour past the fields just in case! Had a great time tip-toeing thru the tulips with you. I think we made out pretty good as roommates. What a fun field trip the bus took you on. Much more fun than heading to school :). The tulips were all absolutely beautiful. I'm not sure if I could pick a favorite, but I was a bit partial to the petal pink too. I enjoyed tagging along on your trip from the comfort of my armchair. Looks like you all had a great time and the cooking class sounds fun too. Enjoy! Such a lovely trip! Tulips are a fave of mine and those were breathtaking! You ladies looked like you enjoyed yourselves -- BRAVO! Wow, what a delectable trip even with all the single files you were involved with and lengthy border crossings. How nice to have a farmer's wives outing where you all have similar interests. The tulips, needless to say, were spectacular as were your photos. All of my favorites here. The outle mall, La Conner, Lepps...their one year anniversary is coming up. I am glad you enjoyed yourself. I will live vicariously through you as I am at work all week. Looks like you had a wonderful time! A girls outing is always fun...flowers, lunch and good friendships. Makes one wish they too were a farmer's wife:) What a fun and beautiful adventure you all had. Your photography helps each of us in various parts of the country, to experience a bit of what you all did. Thank you for sharing. What a special group of ladies. Your pictures are lovely. The colors are beautiful. What a nice time you must have had. My favorite kept changing too.